Tesla Model 3s and Model Xs are equipped with a special glass roof, but it’s only with the onset of winter that people are beginning to notice one of the panel’s most impressive traits. While the Model X is too tall to have revealed this secret before now, the Model 3 is much lower. People have begun to notice how the glass roof sometimes looks a rusty orange colour. Glass can’t rust, obviously, so people have been wondering what is going on. 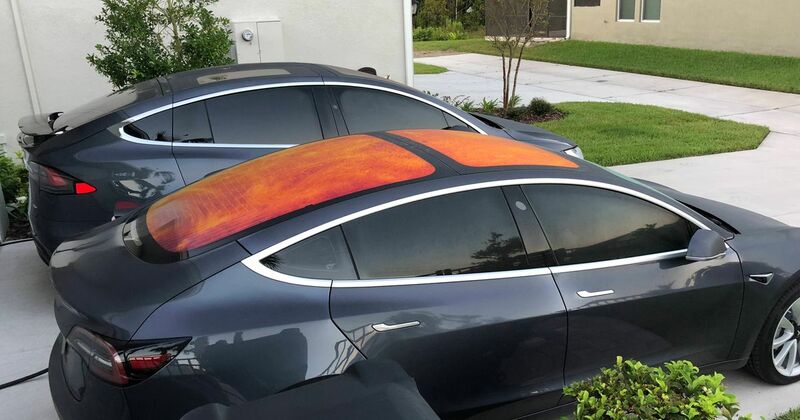 Tesla glass roof after rain looks orange. The two glass panels that make up the Model 3’s roof are more complex than most simple car glass. They are impregnated with a UV-reflective layer that is specifically designed to repel those wavelengths of light that cause an enclosed space to heat up; commonly known as the greenhouse effect. Reducing the greenhouse effect is crucial for an electric car because the climate control has to work less hard, sapping less of your driving range in the process. The other reason that blocking UV rays is so crucial in a glass-roofed car is to avoid sunburn on the sensitive skin on top of people’s heads. Some cheap panoramic glass roofs don’t offer any protection at all. But why orange? Observers have tallied that the roof has to have water on it before it appears this colour. When the droplets are this tiny, the colour looks like a full spread across the roof. It’s simply down to refraction of the rays through the layer of condensation. The rays travel through the droplets twice, changing direction enough to make the UV-reflective layer look orange. This shade indicates the more advanced technology that doesn’t block wireless data signals. Some cars use a metallic layer within their windscreens that sometimes looks purple from the outside, but don’t expect great mobile signal if it’s in a cradle below the screen.